My husband and I love to entertain. This is a great recipe when hosting a patio dinner for your friends because you can make it in advance. You can spend your time visiting with your guests instead of being busy in the kitchen cooking. I like to garnish the plate with some fresh fruit. It brings a delicious balance to the spicy kick the Sirarcha Chili Paste brings to the dish. It has cashews – which I LOVE! Cook turkey in skillet until no longer pink, then transfer to a dish and cool in refrigerator. Remove core from head of lettuce; wash and dry leaves. Combine next 8 ingredients (carrots through red pepper) in a bowl. Stir in cooked and chilled turkey. Arrange lettuce leaves on the outer rim of a serving plate. 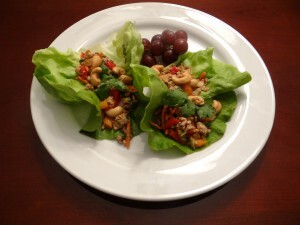 Spoon 1/4 cup of turkey mixture onto the center of each lettuce leaf to create wraps. Garnish with cucumber and cashews. Serves 4.